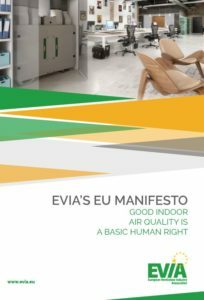 In view of the upcoming European elections, the Voice of the Ventilation Industry, the European Ventilation Industry Association, launched its EU Manifesto aimed at ensuring the future work programme of the European Commission considers Good Indoor Air Quality as a basic human right. On Wednesday, 19 March 2019, EVIA launched its Manifesto on Indoor Air Quality (IAQ) during the EVIA Forum co-organized at the ISH Fair in Frankfurt (Germany) with FGK, the German Association of Air-Conditioning and Ventilation in Buildings. Despite the fact that the new Energy Performance for Buildings Directive (EPBD) better recognizes the crucial importance of Indoor Air Quality (IAQ) in building, EVIA highlights the importance of formally acknowledging the crucial role of ventilation systems in ensuring good indoor air quality in buildings. Most Europeans spend more than 90% of their time indoors and studies have shown how indoor air in our homes, schools and factories can be twice, or even five times more polluted than outdoor air. Poor indoor air quality has an impact on people’s health, on the economy and on the environment. “Only through these measures can we systematically increase overall IAQ in buildings. And this is not a luxury, but a basic human right,” commented Joan Miró Ramos, EVIA Chairman. EVIA members are committed to find solutions to ensure better indoor air quality, and are hoping that the institutional changes to come this year will give policy makers a fresh push towards ensuring proper IAQ for all Europeans. Download our EU Manifesto here and our infographic (in English/German).